8-year-old Hong is visiting her grandma in Taiwan for the first time. colorful beetle in the bathroom. The beetle is so big, it fills the tub. 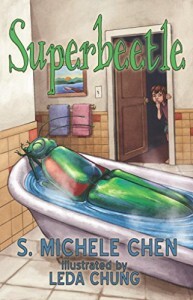 But unexpectedly Hong isn’t afraid of Superbeetle, she likes it! click beetle which is on verge of distinction in Taiwan. The discovery changes Hong’s life and saves grandma’s market from destruction. Hong and grandma relationship takes form, it’s very subtle. while giving the young reader some relief from the plot. Highly recommended for kids ages 6-8.